Event Match 9: Hide 'n' Sheik (ゼルダ転身, Zelda Turnover) is the 9th event match of the 51 event matches in Super Smash Bros. Melee. 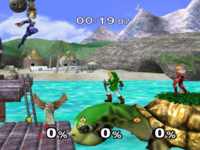 As an available character of their choice, the player must win a one-stock match against two CPUs who frequently transform between Zelda and Sheik. Only Sheik KOs count - KOing a Sheik will eliminate her permanently, while KOing a Zelda will only cause her to respawn. The event takes place on Great Bay and has no time limit. This event match marks the only appearance of the EVZELDA CPU mode, which causes both CPUs to use Transform more often than usual. The name of this event, Hide 'n' Sheik, is a pun on the children's game "hide and seek". This page was last edited on March 17, 2019, at 00:16.